Writing fiction is supposed to be fun. The great part is that you can do anything you want. Write a about a big space adventure? Sure! How about a crime drama set in the old west? No problem, knock yourself out. But what about writing fiction for money? Well, it’s still supposed to be fun. You can still write about anything you want. One would imagine it’s like being a race car driver. You get to race around the track and they pay you to drive an expensive car. It’s the same thing. You pen something up and then other people ohh and ahh over your fantastic words and then you collect a check. Simple. Right? I got into writing for profit for a seemingly unlikely reason. I was laid off. Sunstrand [Pratt and Whitney] [UTC] dissolved their San Diego location. I could see what was going to happen long before my coworkers suspected there was a problem. The company was in such poor shape that I sent my resume out six weeks after I started working there. There were rumors and all kinds of plans to keep the place going. In the end, I worked there for just two years. The work was good I made several friends. After I was laid off, I began working part time for a medical product development company. This work was sparse and there is not a lot of money in it, but it keeps me sane. For many years I had several stories that I wanted to write and I thought about them often. One day I just decided to write up my best three ideas. At the time, I great hope that these three books would lead to instant cash. I was quite naive on how publishing worked. When I first started, I was under no delusion that I was an accomplished writer. My background is Electrical Engineering. I know that I am good at being an Engineer and I know that in general, people only get one bite at the talent apple. My plan was to write three books and then figure out what to do. The three ideas I had were completely vetted in my mind and the words just flowed out. The process took 3-4 weeks each. My last story did have some minor issues wrapping up the ending, but I figured it out. I would not describe the process as fun, but it was satisfying. It was now time to get them published and I started with my first one, Interviewing Immortality. [Hey, quick authors tip. Always put your book title in Italics, it makes you look sophisticated.] After I wrote the three books, I had my mother edit them. She has a lot of English talent and this helped me immensely. And so my financial quest began. I three books and surly one of them would be popular. This process was supposed to be simple and the Internet should now make this easy! Just send the word document off to hundreds of publishers, one of them would like it and they send me a big fat check. There is probably a website that will do all of this for you! Instant payday!!! Well, sending your book off to publishers no longer works that way. In fact, I probably never really worked that way, but it is a nice dream. The reality was that publishers “do not accept unrepresented manuscripts.” [Hey, quick authors tip. Publishers call your book a manuscript. It makes them sound sophisticated.] Getting someone to represent your work is at best expensive and generally impossible. After you do get a book represented, they want at least 20% of your profit. It was pure luck that I got connected with a self-publisher helper and she convinced me to try self-publishing on Amazon. The problem was that I had to put out a lot of my own money up front to get the ball rolling. And again, I thought that after I did this simple self-publishing step that the fat checks would magically appear. I quickly learned that Amazon self-publishing doesn’t work that way. A smart individual like myself would probably have suspected this and done a bit of background research. So, now I had a book on Amazon and I needed to get the word out. In my natural state, I’m a quiet person. I didn’t have a Facebook account or any other kind of online presence. [Well, a few patents… But that is another painful story.] I quickly understood and began building my outward personality. There were ~100 sites for promoting books and I found ~30 of them that were free. That was a start, but that was not a solid connection to the audience I was attempting to connect to. I had always wanted to start a blog. This seemed like a fun thing to do. When I signed up for Goodreads, there was a blog section. This seemed like a good idea and I decided to give it a stab. With some luck, people will enjoy my ramblings and want to learn more. BUY MY BOOK!! ITS LIKE THIS BLOG BUT MUCH BETTER!!! However, this does not answer the main question. Knowing what I know now, why do I write? I am now fully aware that writing for profit is a long road. I have three more books ready for editing and publishing. Getting this done is an expensive process [$5-7K each] and that expense comes right from me. 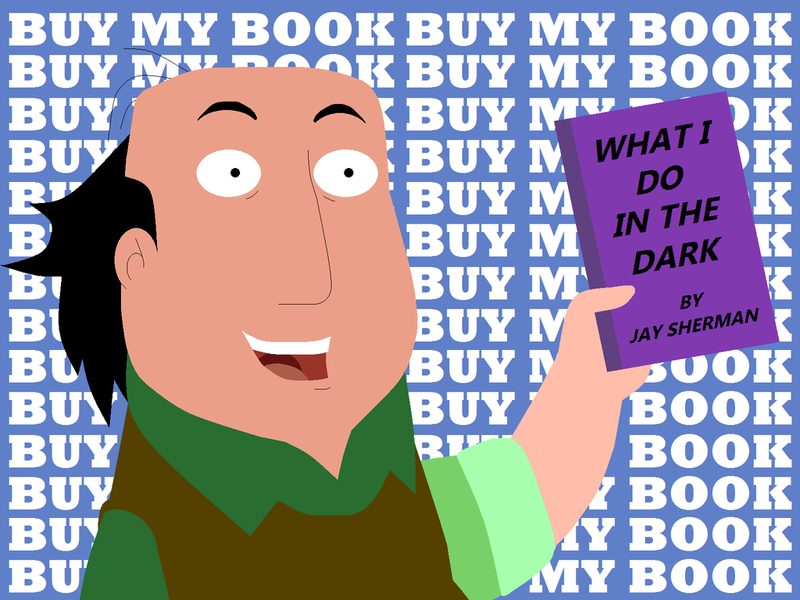 I’m not sure how many more times I can keep self-publishing books with no light at the end of the tunnel. But again, this still does not answer the question that is in the title of the blog. Why do I write? For me, coming up with an idea is easy and I have the ability to put it down on paper. For the moment, I also have the time. Do I get any joy out of the process? That is a more complex answer. How cool was it when I did an internet search and came up with my name as an author. The answer was: so-so. There was also not much joy in telling my friends about my book. I wrote for two years and they didn’t know what I was really doing until I showed them a copy. One friend shook my hand and this was actually a really nice gesture. The true answer to this question comes from a strange place. After I have written a book, I do many self-edits. Tighten a sentence, add a concept, clarify, delete and re-arrange. Each time I go through my book, there is a new application of the story. It may sound strange, but I get a lot of happiness while I am doing this. The story is familiar and I completely know what is happening within the words. I can fully picture what the character is doing and feeling. There is a really strange comfort level to the editing process. I guess it is sort of like putting on shoes that you have had for a long time. They fit, they work, they get you to where you are going and I know for an absolute fact that they will protect my feet. There was an unexpected end to this warm feeling. At some point, I had to let the book fly out of the nest. The edits had to stop and then your work gets to be enjoyed by others. Will they like it? Will they hate it? In my case, I have generally gotten positive feedback with my book, Interviewing Immortality. [Hey, quick authors tip. Mention your book a lot. Repetition leads to sales.] Granted, this feedback was from my friends, but still they liked it. The real issue is getting others interested and then having them tell their friends. Now, Interviewing Immortality is available for sale and the edits have completely stopped. When I was writing the sequel, I went back to the first book a few times. It was a good experience to get back to the original story, but it was not the same. I absolutely couldn’t make any changes and this was a letdown. I suppose in a way it was like meeting an old girlfriend after she was married and reliving old romantic times knowing that you can never kiss her again. Strange way to end my first blog entry. With some luck, there will be many more blogs to follow. One last thing. BUY MY BOOK. Seriously, not having full time work is killing me. I need the money! Spending $2.99 will really help me out. Putting a review online will help me out even more.